Charter our Luxury Motor Yacht CAPRICE Make the most of your holiday by renting our luxury yacht Caprice and plan your own unique itinerary! If you are looking for an unforgettable romantic getaway, birthday celebration, corporate event or just spending the day with friends and family in the sun on the clear waters of the Saronic Gulf, you came to right place! Our captained boat will offer you the best experience! Your one and only job is just to kick back, relax on the deck, sip your drink and enjoy being on the yacht! 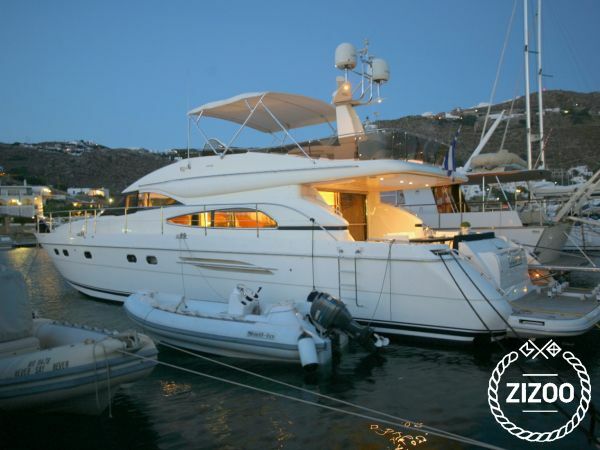 Explore the beautiful Greek waters from Athens (Marina Kalamaki) with our luxury motor yacht CAPRICE. Built in 2002 and fully refitted in 2017, Caprice is everything you would expect from a luxury yacht and more. The solid wood interior is built to very high standards and you will have enough space both inside and outside the cabin to enjoy the hot sun of Greece. On the sundeck, you will find sunbeds where you can see and feel the sea breeze and the spacious flybridge features plenty of space to socialize and relax, with a retractable sunroof overhead to maximize your comfort during your stay and having a table who can accommodate 6 people for lunch or breakfast. Caprice crew of 2 (captain & sailor) will ensure charter guests will have an unforgettable trip. Our crew and cruises are tailor-made to suit all your needs, from a quick getaway, birthday and bachelor parties, weddings, honeymoons to corporate events- everything you need to make it special! Our motor yacht Caprice can be rented privately for daily escapes or as a charter. For private and daily escapes, the protocol is for 10 guests and for charters the protocol is for 8 guests (2 MASTER cabins with en-suite baths, 1 TWIN cabin with en-suite baths and 1 cabin with 2 single beds up&down).